“Fox News’ Megyn Kelly, who has herself been on the receiving end of some of Trump’s insults, had Fiorina on her show “The Kelly File” as a guest Wednesday night. 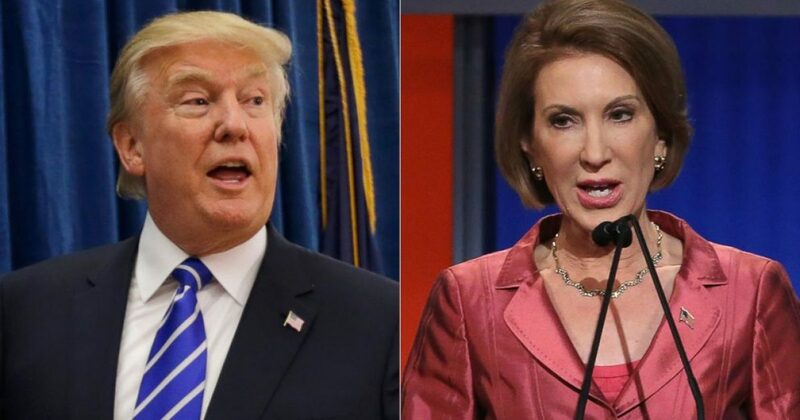 She read part of Trump’s quote to Fiorina and asked for her reaction. I find this entire subject and the reported exchanges at once amusing and annoying. These women, who profess their equality, are squealing like little girls on the playground after making snide remarks to the captain of the football team. Fiorina’s statement that she’s “under [Trump’s] skin” is ridiculous at best. It is he who’s under everyone’s skin, which is why he’s the man of every hour, every day, all week long. Fiorina further reveals her inferiority when she exclaims that she’s climbing in the polls. Note to Carly: flailing wildly from the bottom of the pack is hardly climbing. Trump’s a man who excels at negotiating the deal artfully and exercising his extraordinarily inherent abilities to do so includes the psychological warfare of successful negotiations. He’s shutting all comers out at this juncture in time as a result of rejecting Political Correctness for speaking in plain language and American voters continue to eat it up. To those who are opposing Trump in the 2016 race for POTUS, it would be most prudent to don one’s armor each day before getting into the ring with him. Thick skin is required. If you’re easily offended or facing fire make’s you light-headed, you might want to reassess your own strengths and weaknesses before you attempt to take on Captain America. As a native New Yorker myself, I lose respect for those who step up to fight and then complain when they’ve underestimated their opponent and are losing the battle in their minds, before the first physical blow is thrown. This is often referred to as being one’s own worst enemy. Mia Constantino Cachilli is a contributing editor/writer for UnhyphenatedAmerica.org and TheBlackSphere.net. She earned her Bachelor of Science degree in Management Information Systems (M.I.S.) from the University of South Florida and an Associate of Arts degree in Business Administration from St. Petersburg College.